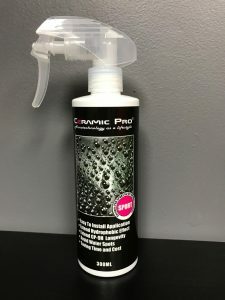 Ceramic Pro 9H is a multi-functional coating that can be used for both interior and exterior protection. It is a highly durable protective coating that protects a vehicle’s paintwork and other surfaces from damaging contaminants. It will not wash off or break down, and can only be removed by abrasion. 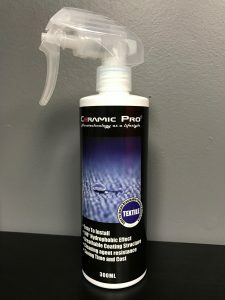 Ceramic Pro Sport maintenance coating was designed for Ceramic PRO 9H maintenance. 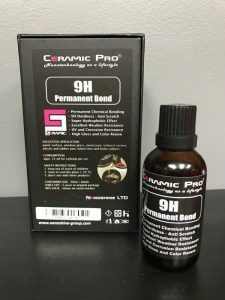 Pro Sport can be used to maintain Ceramic PRO 9H, to keep the super hydrophobic effect, and also avoid water spots. Sport can also be used as a stand-alone coating and is an easy to install solution. 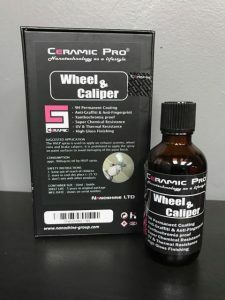 With the Ceramic Pro wheel & caliper coating, cleaning your car rims will be easier than ever! This coating makes the surface of the wheels and rims smooth so containments won’t stick to them! Ceramic Pro Textile is a reliable inorganic compound that repels spills and stains. It modifies surfaces so when liquids come into contact with the fabric, it forms beads that simply roll off. This keeps the textile substrate dry without affecting the factory look and feel! 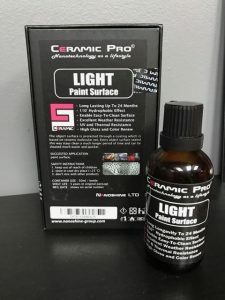 Ceramic Pro Plastic and Rubber is a unique coating for both interior and exterior surfaces. 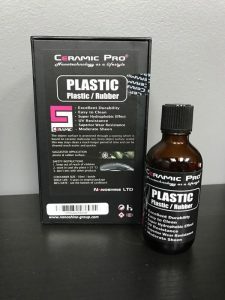 Coating surfaces with Ceramic Pro Plastic and Rubber will give them a hydrophobic effect with wear resistance. 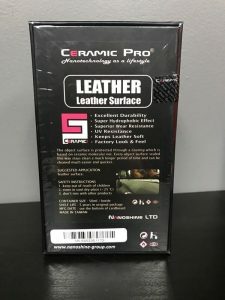 Ceramic Pro Leather has a super hydrophobic effect, protects against UV light, is easy to clean, keeps leather soft, and preserves the factory look & feel! Your leather will stay cleaner longer and stay protected against dirt and grime.